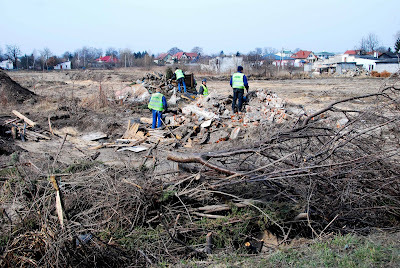 I was curious to see if work was progressing on Warsaw's southern bypass. And indeed it was. Above: A clearance crew has just arrived at work, clearing rubble on ul. Poloneza. Above: View showing rail crossings on ul. 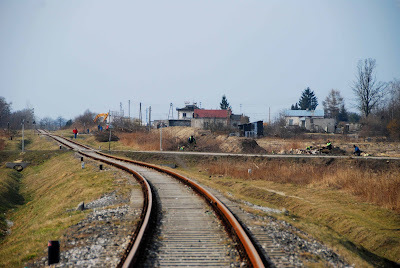 Poloneza (nearest camera) and ul.Oberka (in distance). Beyond that a digger at work. Several houses on this stretch will be demolished. Above: Looking south along ul. Poloneza. 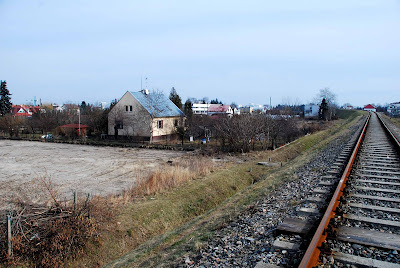 Houses will be demolished; Poloneza looks likely to be widened in preparation for viaduct over bypass (that will run behind camera's point-of-view, parallel to railway tracks. More houses in the way of the road. Above: six buildings between here and ul. Puławska. In one, there were signs of the owners moving out, packing their things onto a trailer. A digger was working on demolishing another, clearance crews were at work. Above: ul. Puławska, the major artery running into the centre of Warsaw. 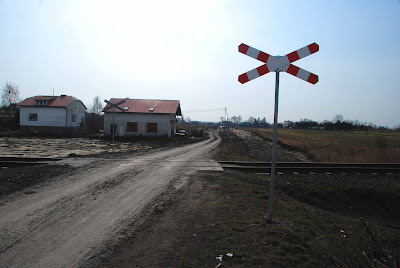 There will be a major junction here; the bypass will cross over Puławska at this point. At some stage, the used car dealer on the other side of the road will have to move. While the flyover is being built, there will be absolute commuter chaos - which could last for two or more years.